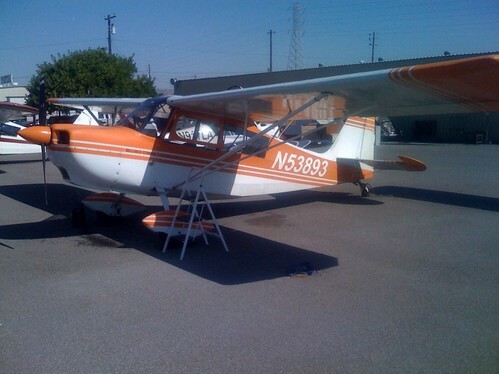 One more flight and I should have my tailwheel endorsement. My first experience flying a stick controlled aircraft. Lots of fun. Airplane in the pic is a Bellamca Citabria at Amelia Reid Aviation, Reid Hillview Airport. Before I forget the details, I have to put this on record. My Private Pilot certificate checkride happened on November 2nd 2007 and this is a brief description of my experience. Needless to say, there is a tremendous amount of effort required to get through the training. From my perspective, I had three major stages in the training. The first solo flight, the knowledge test (during the time you are busy doing the cross country and night flights) and all of that leads you to the final checkride. It took me one year and 2 weeks to do all that. As of 11/02/2007 1.45pm, I have a FAA Private Pilot Single Engine Land certificate or most commonly known as a Private Pilot License (in India). It took me rest of the day on Friday and this morning to catch up with what had just happened. After the Checkride, I was driving back home and my head just went quiet as if a hammer hit me. Met Tom this morning and he said something that I am still trying to absorb – “Do you realize you can now fly to *anywhere*? That means *anywhere*! To the beach, to Seattle, even to California, whenever you want to“. I was so involved with the training and enjoying it that I had not given any thought to what all I could do once I had the certificate. It is still a bit hazy. I can fly any single engine land airplane which has a 200BHP or less engine and which does not have a retractable landing gear. Once the rest of the paperwork is complete, we might fly down to Siletz bay tomorrow. The beach is walking distance from the airport. The checkride was an interesting experience. More on that later. The night flight was awesome! Made my flight plans and reached the airport at 7.30 pm. Tom was already there. Plan was to do 10 stop and gos and a total of 3 hour in-flight time to meet the license requirements. I filed the flight plan, did the pre-flight checks with a red flash light. That takes a few minutes to get used to. Because Pooja was with us, Tom and me had to do 3 touch and Gos for him to be night-current before she could hop in the airplane. That was an interesting experience. Wind was pretty strong, kind of a crosswind blowing at 14kn. I did the runup and taxied short of runway 30. Tom took over from there, did 3 touch and Gos and then I took the controls back to taxi back to parking. Yay! So it is that day when the forecast for night flying is good and Tom is available too. I am really excited, so is Pooja. Plan is to fly from Hillsboro Airport to Aurora (KUAO), fly over it and catch I-5 South and follow that till Salem and then cut across to Corvallis (CVO). And then trace the same route back to Hillsboro. Need to plan for it and condition myself for the 10 takeoffs / landings at night.